After two weeks of Olympic drama, our Greatest Show on Earth had come to an end. Despite frantic F5’ing on the official London 2012 website no further tickets came up that would have fitted our schedule so we had to be content with a Decathlon of watching – 10 different events in 10 different venues. But now it was time to put the football hat on. The Olympics had kept the footballs off of the back pages for once at it almost slipped out of sight and out of mind. But reality bit hard at my first board meeting of the “new season” and talk came around to the opening of the nPower Championship this weekend. This weekend! Where had the summer gone. I shared my dismay with CMF but she did rightly point out that I had already seen twelve games since my official season start of the 1 July. I needed to prepare, plan my strategy. It’s not as simple as picking a game and then turning up. Oh no…a 100 game season needs stamina, energy, cunning and above all determination. There was only one thing for it – a pre-season training camp. And I knew just the place. Somewhere free from the trappings of the modern world. No telephone reception, no wi-fi and no cars (In truth based on my recent experience of using T-Mobile that could apply to anywhere in Central London). A complete break to study the form, examine real old fashion maps, have a few beers, run around a lake and then jump in an ice bath. Our country retreat was perfect. Miles from the main road, surrounded by woodland and with my family. Within an hour of arriving we had seen deer, geese, ducks and rabbits all hopping around our patio. Unfortunately they didn’t stay long. I forgot to add that at Centerparcs you are never more than 1.7 metres from another human being and so our “neighbour” decided to try and catch the duck to put on his BBQ that was filling our villa with acrid smoke. After an afternoon of research I headed to the bar, not being able to last more than two hours without some kind of link to the outside world. I wandered into the Parc Market and picked up the local paper. On the back page, just above a picture of Jess Ennis was an advert for Bury Town. 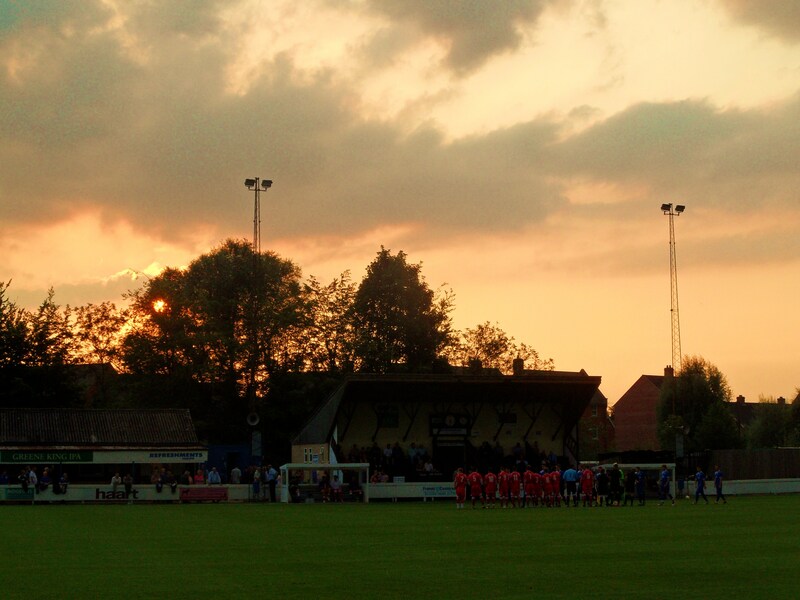 They were playing their final friendly, on this very night in a local derby against AFC Sudbury. I had to go. I had three reasons/excuses to give to my girls who were patiently waiting for their Starbucks. One – It was ONLY 12 miles away. 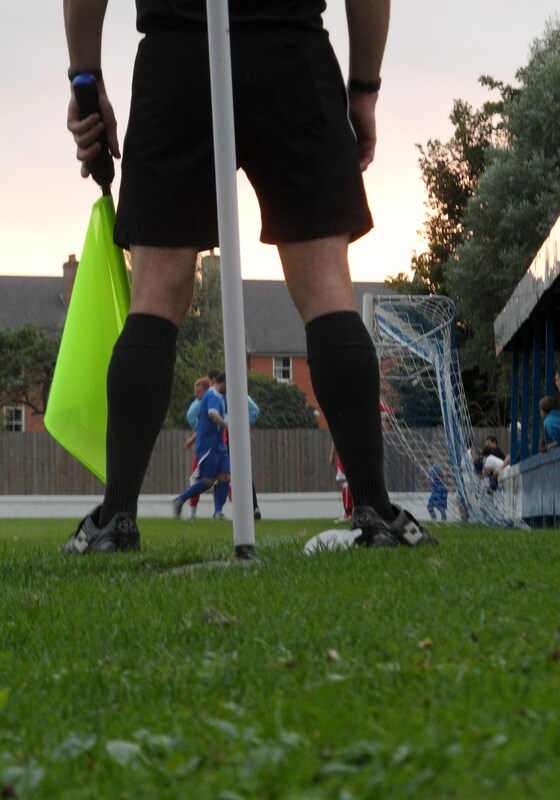 Two – It was the only ground in the Ryman Premier League that I didn’t get to last season (and would have been one of three “unvisited” ones this) and Three – I was going on a scouting mission for Lewes. The third wasn’t technically true but as a football club Director I am always on the look out for new players, as well as good ideas that other clubs have adopted. I bought a gingerbread man to soften the blow and after the usual exasperated look to the heavens I had the right level of accreditation. So I headed off down the roads of Suffolk into the heart of Ruddles County. Bury St Edmunds, the home of Greene King and their world famous IPA. The town is a classic Market Town, the ancient hub for the local area. I parked the car and had a wander. Eddie The Shoe had given me a tip. Now normally his tips involve animals with four legs (and pretty good they are too) but in this instance it was one to refresh the parts other venues cannot reach. 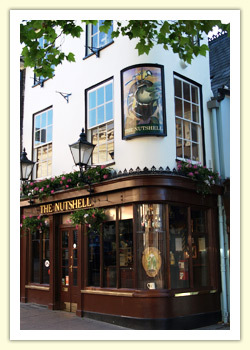 “Head for The Nutshell – Britain’s smallest pub”. If it wasn’t for the huge sign outside I would have missed it. Like an attraction at Disneyland they had an efficient queuing system outside to ensure there was no overcrowding inside. They were queued one deep at the bar, and as soon as I had my turn I triumphantly raised my Abbot Ale above my head in triumph before moving aside to let someone else reach the bar. A few minutes walk through the cobbled market square, passed the impressive cathedral and I was walking into Ram Meadow, home of Bury Town. The club had risen through the regional leagues, before being accepted into the Southern League. 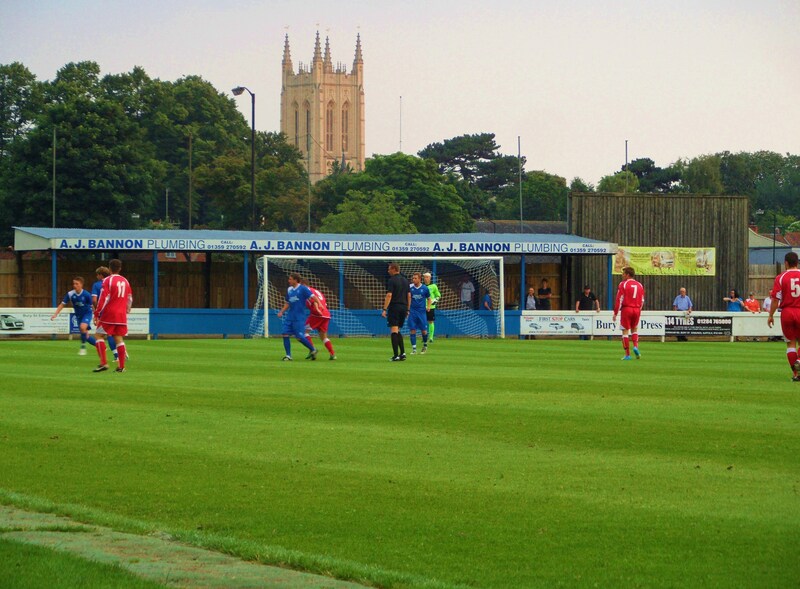 A transfer request to the Ryman was granted in 2007 and since then their progress had been mirrored by fellow Suffolk rivals Lowestoft Town, and over the past couple of seasons both had reached the Ryman Premier League, and almost one step further, losing in the last two end of season play offs. 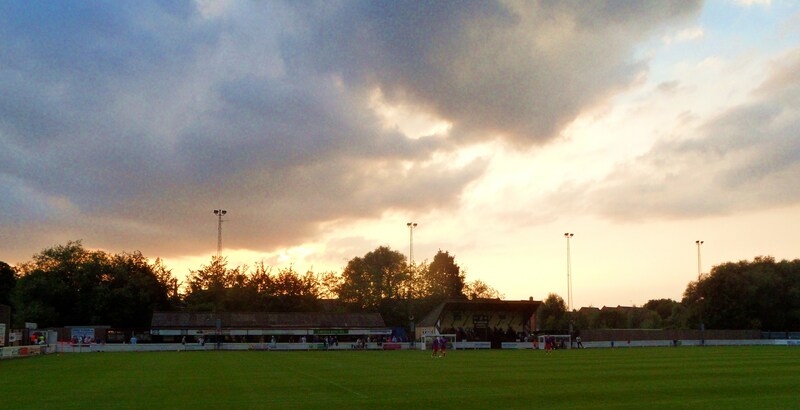 Suffolk was fast becoming the hotbed of Non League football. As well as the two “giants”, they will be joined this season by Leiston Town (basically Sizewell Nuclear Reactor FC) who have also shot up the leagues, Needham Market and tonight’s visitors, AFC Sudbury. Ram Meadow is a fantastic Non League ground. Standing behind the north goal the view of the cathedral in the background is one of the best in English grass roots football. It just oozes character, the main stand looking like a relic from a bygone era yet still functional today. The modest crowd were enjoying football being back on the agenda, as well as the cold Greene King IPA. Hopes were high that this season Bury Town could go one step further than their previous two seasons Play Off spot, although I am sure the likes of Lowestoft, Carshalton Athletic and of course, the mighty Rooks would have a say in that. The first half was a pretty even affair. Both teams had the ball in the net in the first thirty minutes, but the assistant referee on both occasions had the final say. Bury looked to play the ball up to their big centre-forward whenever they could and he was a constant thorn in the side of the Sudbury defence. However, whilst this was only a friendly, it was difficult to see who the higher placed team in the league structure was. The opening goal came in the 40th minute and was scored by a real blast from the past. Sudbury’s number 10 took the ball into his stride, beat his man and hit the ball across the Bury keeper into the corner of the net. He had been doing this for nearly fifteen years since I first saw him as a raw 16 year old playing for West Ham’s impressive youth team alongside the likes of Rio Ferdinand and Frank Lampard. Lee Boylan is his name and he was burdened with the tag from an early age as being the “new Tony Cottee”. Unfortunately he never got the chance under Harry Redknapp who preferred to bring in unknown, untried and basically useless foreign players. His “United Nations” side of the mid to late 1990’s may well have been entertaining to watch but it stifled the growth of the young players coming through and ultimately cost him his job in circumstances that still have never been fully explained today (although Tom Bowers in his book Broken Dreams does a good job). Half time saw the fans head into the bar for some Olympic action. Those who had sneaked in early would have seen Team GB make a complete pigs ear of the 4 x 100m relay, which was then followed from a complete masterclass by the US women who smashed a world record that has been held for so long that the previous holders do not exist as a country anymore (East Germany). Pint of IPA in hand I ventured out for the second half. Both teams had made changes and it was unsurprising that the first ten minutes or so were cagey, with both sides holding onto the ball. But it was Sudbury who doubled the lead on the hour mark when that man Boylan again scored, poking the ball home at the near post from a Webb cross. Bury looked wounded and with local pride at stake they pushed forward. Sam Reed was unlucky with his shot that hit the crossbar with the keeper well beaten. Finally they got their goal when Hall seemed to walk straight through the Sudbury defence and had time to pick his spot. Three minutes later they had an equalizer when Billy Clarke took advantage of defensive indecision. For those of you older than 45 you may remember an incident from the 1970’s when George Best “tapped” the ball out of keeper Gordon Banks’s hands and tapped the ball home. Debate raged for ages about the incident as Banks appeared to only have one hand on the ball and thus Best could go for it (A similar incident happened in the 1990’s with Andy Dibble and Gary Crosby in a Man City v Forest game). With just three minutes to go something similar happened here. The Sudbury keeper Danny Gay appeared to have the ball in his hands before Bury’s Clarke kicked it out and then tapped it in. The referee certainly didn’t see it, and neither did his assistant. After some consultation they gave the benefit of the doubt to the defending team. I didn’t want to push my luck too much, so dead on 90 minutes I headed back to the pre-season training camp and the bosom of my family. It seemed that swimming in my absence was a success and I was welcomed back with a freshly poured London Pride on the table and a smile on their faces. Pre-season training was going well! From the peace and relaxation of our Suffolk training base we move onto serious heavy duty football season conditioning training next weekend as we head down to Nord Rhein Westfalon. What better way to get really in shape for the season than a trip to the land of beer, sausages and general mirth and mayhem at the hands of Kenny Legg, The Real Stoffers and Danny Last. Of course, it is always Danny Last. This entry was posted in Non league football, Rymans League, Rymans Premier and tagged AFC Sudbury, Bury Town, Ryman Premier League. Bookmark the permalink.